This week Liam treated me to a spot of late lunch/early dinner at the Porterhouse Steakhouse in Winchester. Located in the centre of the city, I've walked past the restaurant many times when I worked in Winchester but this is the first time we visited. Porterhouse Steakhouse is a modern restaurant serving (surprise surprise) an array of beef dishes, grilled meat, seafood and also caters for vegetarians. We were starving by the time we got to the restaurant - Liam had a productive day off working on the house, and I had just come back from a morning of client meetings which stretched way into lunchtime. 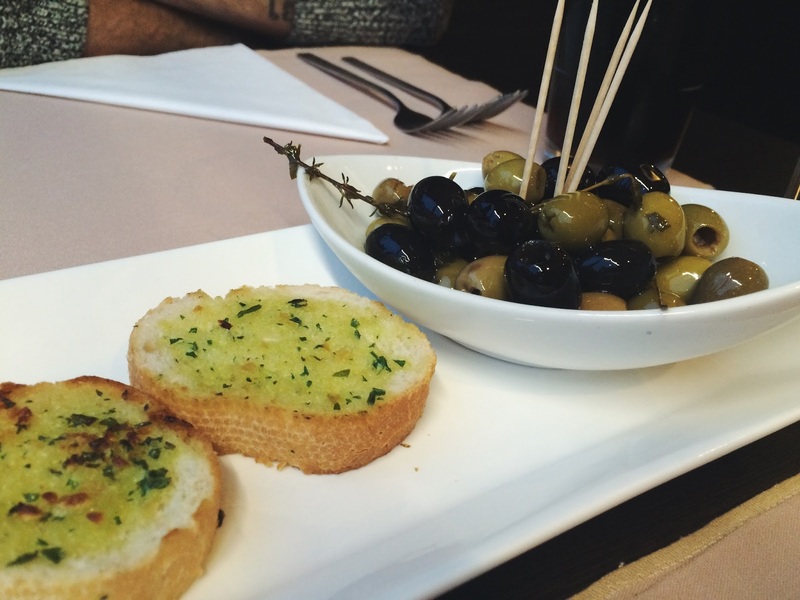 To be honest, I thought we were simply going to grab a light lunch somewhere, but we ended up having an early dinner out - for starters we ordered marinated olives, rosemary marinated grilled calamari and steak tartar. 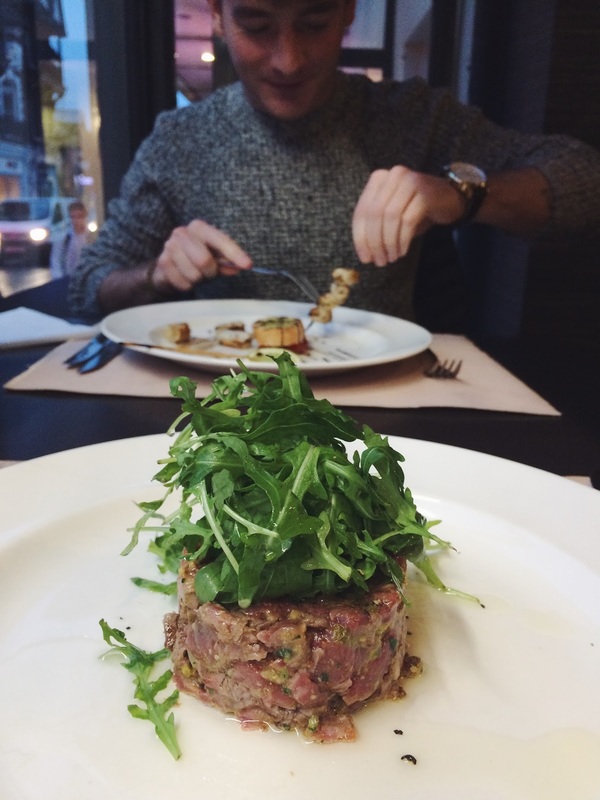 I LOVE raw meat and fish, so meat for me has to be rare and where possible blue - so steak tartar is literally heaven on a plate for me! 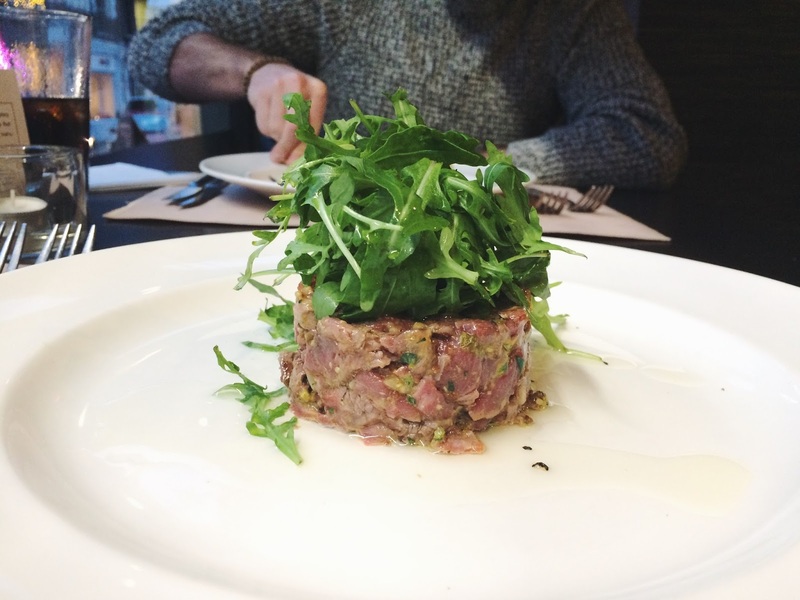 The steak tartar is seared fillet steak minced with capers, mustard seeds, shallots, parsley, and Worcester sauce - a delicious mix of flavours with tender meat to taste. I thoroughly enjoyed my started - in fact, I could have eaten a whole bowl of the mince!! The calamari were soft and tender (just as calamari should be, NOT rubbery!) 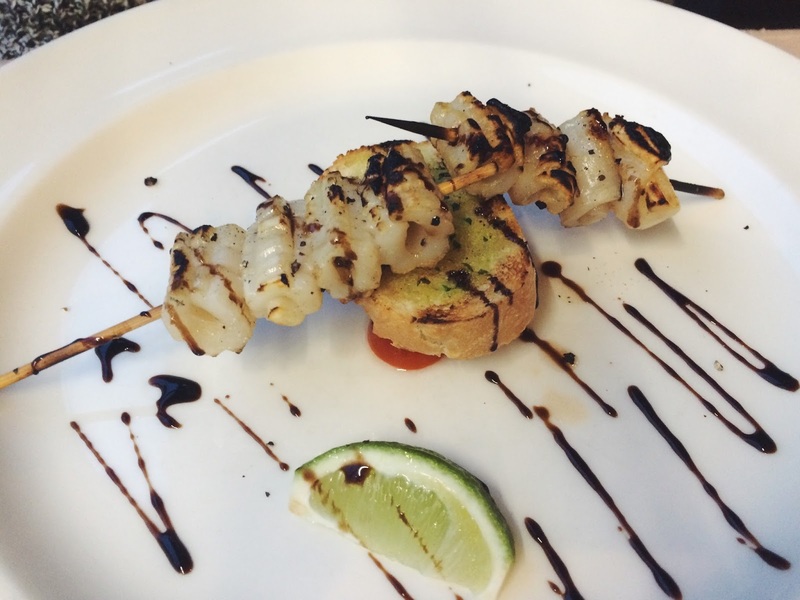 and had a beautiful smokey grilled flavour - Liam loved the starter and I could tell he was pleased with the quality of the food. 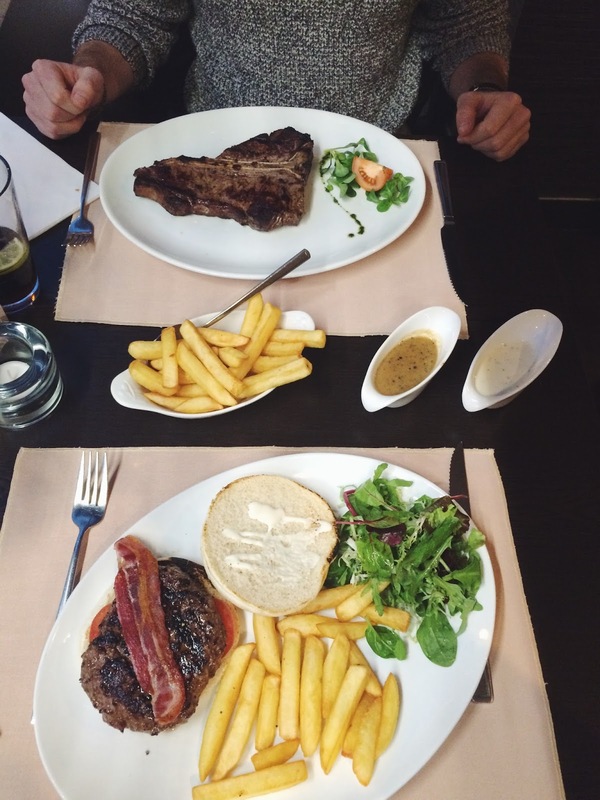 When it came to mains, we couldn't decide but luckily we were torn between the same things - so we ordered a burger, and a T-Bone steak. I always ask the restaurant how they cook their burger - again, I think well done burgers for my taste are quite dry so ideally I like mine to be medium but if possible on the medium-rare side. It used to be a good way to determine the quality of the meat used - but now with the regulations agains rare burgers (you heard it right - there are now rules and regulations stopping restaurants serving rare burgers. Big Brother much??!) it's much harder to get a decent burger. BUT saying that, Porterhouse Steakhouse do cook their burgers medium to well done, which I was kind of worried about - the burger I ate was cooked to perfection. Juicy, flavoursome and still a little pink inside - these guys know what they're doing! 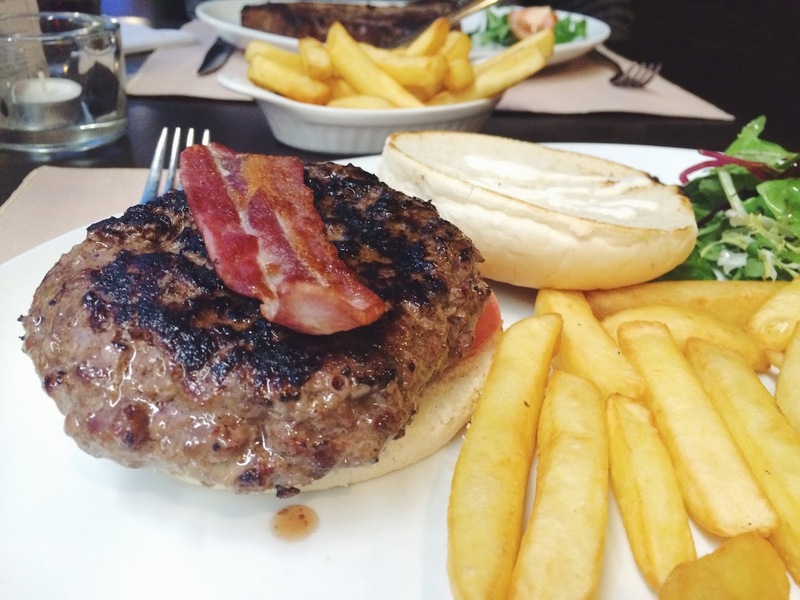 The burger is served on a soft bun, topped with bacon, side order of chips and a salad. It was the second best burger I've had around the area where we live (Bourne Valley Inn still holds the best burger for me at the moment) - I highly recommend it! The T-Bone steak was cooked medium (Liams choice - and a really good choice!) and was just the right portion size. Because the meat was so flavoursome and tender, it was easy to eat - especially dipped into the peppercorn and garlic sauces. Served with chips and greenery, the meal was perfect. We both agreed that our meals were fantastic - just the right amount on plates, with juicy and flavoursome meat and delicious sauces. I didn't expect to be reviewing anything so that's why the photos have been taken with my phone - but I couldn't not share this Winchester gem with you guys! 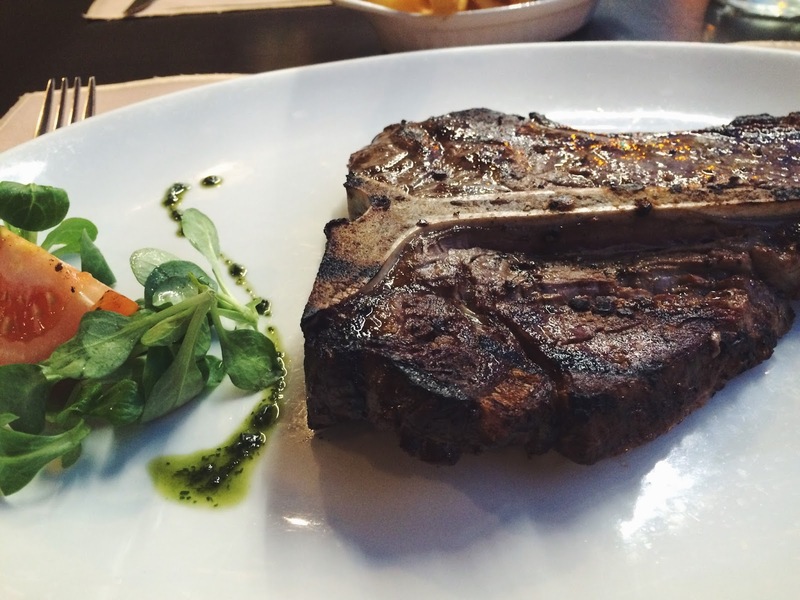 Porterhouse Steakhouse in Winchester serves delicious food and is perfect for a dinner date or birthday meal. I thought the prices were fair for what we were served - steaks are priced around the £20-£30 mark so be prepared to spend a little - and other dishes are between £15-£20.